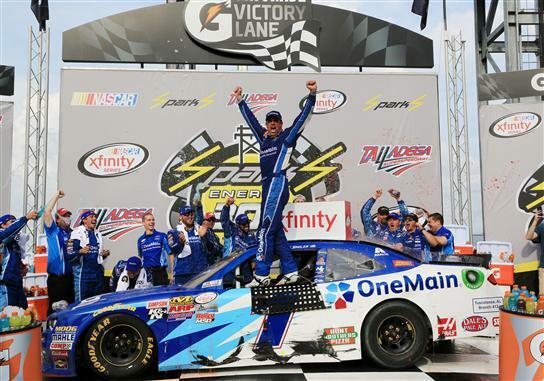 Elliott Sadler is one contest away from a single-race four-driver shootout for the NASCAR XFINITY Series title. Before he can prepare for running in the Championship 4 race at Homestead-Miami Speedway, Sadler must transfer through the penultimate event of the season in the series where names are made – Saturday’s Ticket Galaxy 200 at Phoenix International Raceway (7:30 p.m. ET on NBCSN). Positioned 16 points ahead of his JR Motorsports teammate Justin Allgaier – the first driver out for a berth in the Championship 4, — the 41-year-old Virginia native has a strong Phoenix resume. In 15 starts at the one-mile track, he claims one win (spring 2012), four top fives, eight top 10s and a 12.1 average finish. He has finished 12th or better in his last seven Phoenix starts. Sadler used a baseball analogy to further explain his points situation.